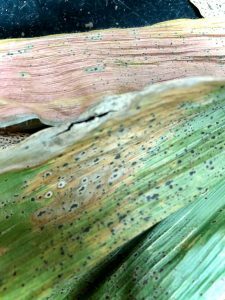 Concerned about tar spot on corn in 2019? Haven’t been able to get to a winter meeting to learn how you might control it, in Wisconsin? We have a solution for you! 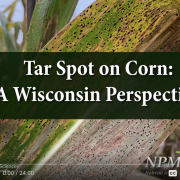 A new video was just launched where Dr. Damon Smith presents a short lecture about tar spot on corn including symptoms, severity, and hybrid and fungicide trial results in Wisconsin in 2018. This lecture is meant to tie together our research progress in 2018 to guide management recommendations in 2019, in Wisconsin. 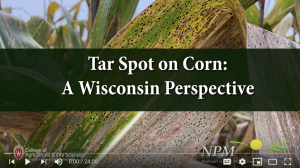 For other information on tar spot in Wisconsin, you can consult our previous video or check out our previous posts on tar spot symptoms and pathogen signs on corn, and hybrid response to tar spot. You can also find information about fungicide efficacy in 2018 by downloading our 2018 Wisconsin Fungicide Test Summary. If you are like me, you are probably wishing 2018 would just go ahead and get it over with. It was a challenging year for farmers, practitioners, and extension personnel. This fall and winter has been consumed with questions and meetings trying to evaluate all of the disease issues of 2018, especially on corn. The topic of main concern has been tar spot and what the data are telling us in terms of managing this problem moving forward. I’m not going to re-hash what tar spot is and what causes it here. If you want to know more about the disease, you can read my previous post on the subject or watch my short video. I will say that the epidemic was significant and in some locations in Wisconsin, hit yields reasonably hard. I am getting a number of questions about hybrid resistance to tar spot. Is there any? What hybrids are resistant? Well, let’s take a look at a little data. The epicenter of the 2018 epidemic in Wisconsin was definitely in the Southwestern part of the state. Areas around Cuba City to Platteville were hit hard and early. As part of the Wisconsin Hybrid Performance Trials a test plot was evaluated for tar spot near Montfort, WI. Details of the implementation, data acquisition and other information pertaining to the Wisconsin Hybrid Performance Trials can be found by clicking here. In addition to the data that was described there, we evaluated tar spot severity and canopy greenness and related that information to grain yield. Those data are below. Disease ratings for this location were performed on two dates. 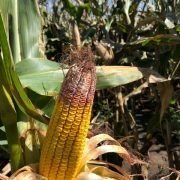 For the early (98-106 day) relative maturity (RM) trial we rated tar spot severity on the ear leaves on 8/31/2018. For the late RM trial (104-113 day) we rated tar spot severity on 9/4/2018. In addition to taking tar spot data, we also determined the canopy greenness as the relative percentage of canopy still green on that rating date. Many have observed that as tar spot severity increased, corn plants tended to dry faster. The greenness score was meant to understand the level of senescence relative to the tar spot severity level. Yield was determined as described in the details of the hybrid performance trials. We then used standard mixed-model analysis of variance to determine differences in tar spot severity, canopy greening, and yield. We also looked at the relationship of tar spot severity to yield using linear regression. This latter analysis was meant to understand the yield reductions relative to the tar spot severity across hybrids at this location. For both the early RM trial (Figure 1) and the late RM trial (Figure 2) there were significant differences in tar spot severity among hybrids tested. Figure 1. Tar Spot Severity and canopy greenness for early RM hybrids at Montfort, WI in 2018. Figure 2. Tar Spot Severity and canopy greenness for late RM hybrids at Montfort, WI in 2018. Some hybrids do appear to be relatively resistant with severity ratings averaging 10-20%. However, other hybrids seems quite susceptible with severity ratings near 50%. No particular brand had hybrids that were more resistant than the other brand. Each hybrid varied in its level of resistance within brand. Also, note that no hybrid was completely devoid of disease. There appears to be no complete resistance to tar spot, but definitely some partial resistance in some hybrids. Canopy greenness was generally negatively correlated with increasing tar spot severity. What was interesting is that as tar spot severity (area of the ear leaf covered by tar spot, spots) increased to 50%, canopy greenness often fell almost to 0%! Indeed, tar spot does seem to induce early senescence, especially in hybrids that aren’t as resistant. Figures 3 and 4 show yield data from both the early RM (Figure 3) and late RM (Figure 4) trials for each of the same hybrids from the figures above. Hybrids are in the same order, and in both cases, there does seem to be some general yield reduction from low tar spot severity to high tar spot severity. But how much? Figure 3. 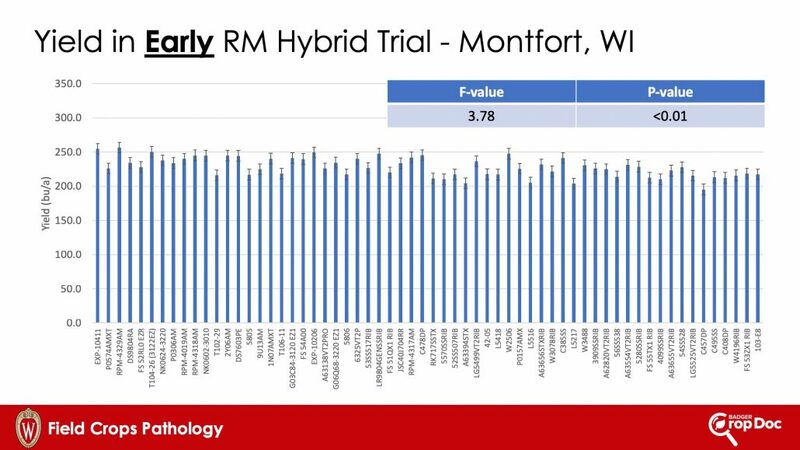 Yield from the early RM trial at Montfort, WI in 2018. Figure 4. 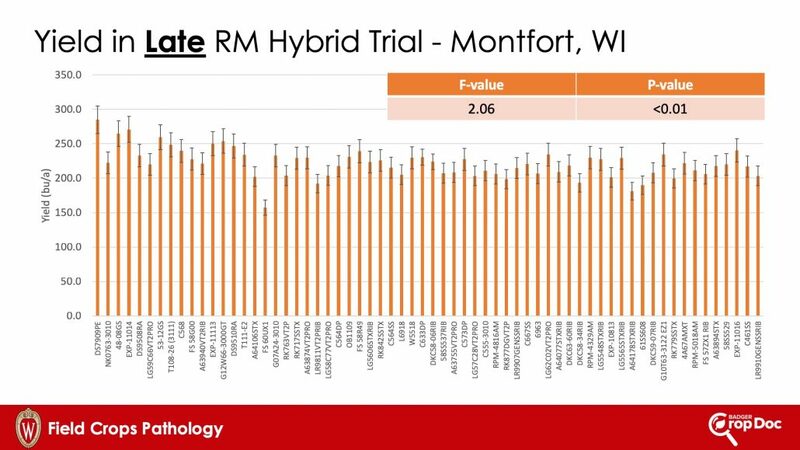 Yield from the late RM trial at Montfort, WI in 2018. Our subsequent linear regression analysis (Figure 5) shows that there was clearly a trend toward lower yield as tar spot severity increased. For the early RM trial the fit of our line is better than for the late RM trial, however, the slope of the line indicates that there was a general reduction in yield as tar spot severity increased. 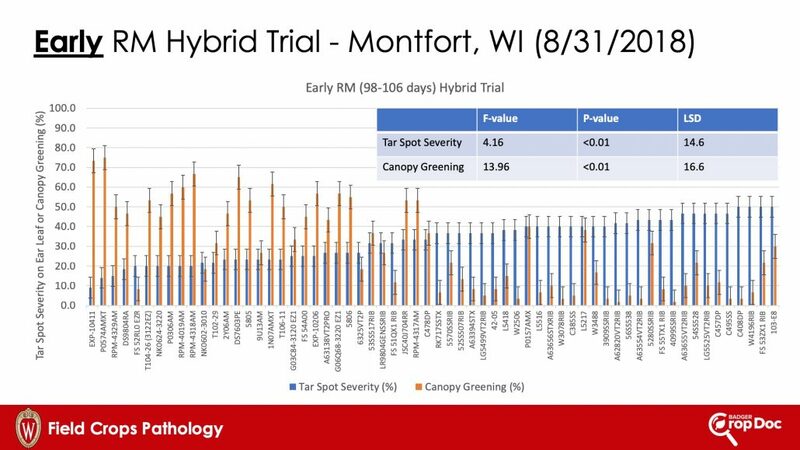 For the early RM trial as tar spot severity increased by 10%, yield was reduced by about 7.8 bushels/acre, however, yield potential in this trial was almost 254 bushels/acre. In the late RM trial yield potential was 262 bushels/acre, but for every 10% increase in tar spot severity, yield was reduced by 13.5 bushels/acre. Clearly there is some error in fitting our lines here and some “noise” in the data. This is most likely due to some differences in RM rating among companies and inherent genetic differences. However, there does seem to be a trend that as tar spot increases, grain yield in corn can be reduced. 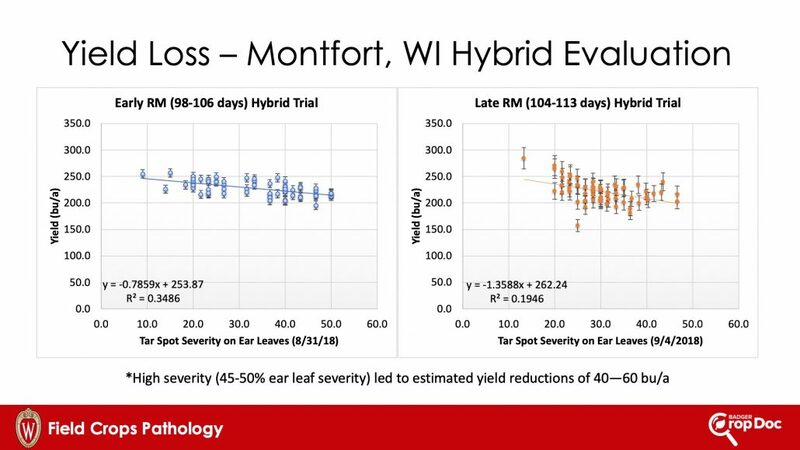 At this particular location, if we extrapolated our estimates out, at high ear leaf severity (45-50%), yield was reduced by 40-60 bushels/acre. Figure 5. 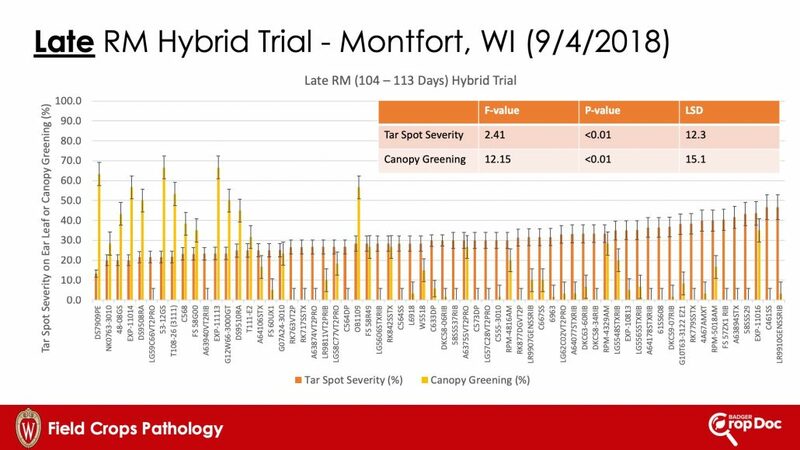 Yield relative to increasing tar spot severity for the early and late RM trials at Montfort, WI in 2018. Some corn hybrids are more resistant than others to the tar spot pathogen. Resistance is not tied to a particular brand. That is to say, when it come to tar spot, every hybrid has to stand on its own. Strong resistance in corn hybrids in the trial above wasn’t common and immunity did not exist. As you make seed selections for 2019, push your seedsman to show you data from other trials for a particular hybrid where tar spot was a problem. Check other states data if you have to. For example, Dr. Martin Chilvers at Michigan State University conducted similar tar spot ratings on hybrids tested in Michigan. You can find the results of these hybrid evaluations by clicking here. Look for hybrids that gave a consistent response across multiple locations. Realize, even the best hybrid will still get some tar spot if the weather is favorable for the disease. Fungicides might be warranted to further reduce tar spot once you have chosen a resistant hybrid. There are fungicides that do a decent job of reducing tar spot severity. The 2018 Wisconsin Field Crops Pathology Fungicide Tests Summary includes several trials where the efficacy of tar spot was evaluated. You can find those trials by clicking here. While there does seem to be some good choices in fungicide products, timing of application will be critical. It seems that fungicide applications that most closely coincided with the onset of the tar spot epidemics in a particular location, gave the best results. Thus, the performance of a fungicide will only be as good as the application timing relative to the start of the epidemic. To assist in making recommendations to spray, we are working on a tar spot prediction tool.  Look for details of this tool next summer and be sure to follow Wisconsin Crop Manager News and Badercropdoc.com to get the latest updates and recommendations. Gibberella ear rot on corn. The 2018 corn growing season has been met with numerous disease challenges this season. 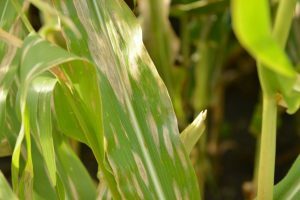 From typical foliar disease issues like gray leaf spot and northern corn leaf blight, to new diseases like tar spot and bacterial leaf streak, the season has not been easy. As we have started to chop silage, ear rot and mycotoxin issues are also readily apparent. In an effort to address the new disease, tar spot, we have put together a new video on what we know and don’t know. You can view that new video on YouTube, by CLICKING HERE. We have also assembled a second video on ear rots and mycotoxin issues in silage corn. That video can be found on YouTube by CLICKING HERE. We hope you find these videos informative and help you gain ideas to manage these issues in your operation. Corn is looking pretty rugged in many areas of the Wisconsin corn belt. 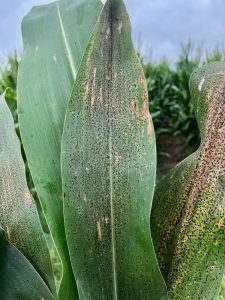 Areas in southern, southwestern, and south-central Wisconsin have experienced major foliar disease epidemics including the new disease, tar spot. Areas in eastern, east-central, and south-central Wisconsin have also seen heavy flooding and storm damage in corn fields. 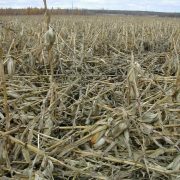 We have seen fields severely diseased, experiencing stalk rot, lodged, flooded – you name it, it has been a challenging finish to a season that had much promise. 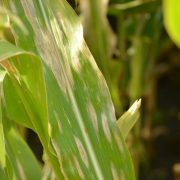 How is tar spot affecting stalk integrity? Figure 1. Stalks lodged due to reduced stalk integrity. 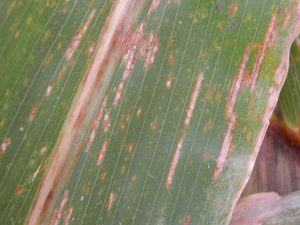 For corn foliar diseases such as northern corn leaf blight (NCLB) and gray leaf spot (GLS), it is well known that high severity can lead to stalk integrity issues. As foliage is damaged, less photosynthetic capacity is available from the leaves to produce carbohydrates for the plant. To fill an ear of corn, carbohydrates are needed from somewhere. In corn where the foliage is significantly damaged, the stalks become a considerable source to fill out the ear (a sink for nutrients). This leaves the stalk tissues devoid of carbohydrates leading to cell death and subsequent colonization of the stalk by fungal pathogens who are taking the opportunity to feed on a weak stalks. 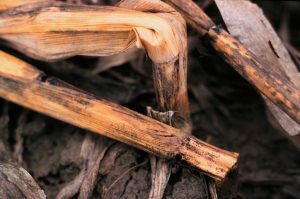 Thus, it isn’t uncommon to see stalk rots like Gibberella stalk rot, Fusarium stalk rot or Anthracnose stalk rot at higher incidence where high foliar disease pressure was observed (Fig.1). Where you find stalk rots, you often find root rots caused by the same pathogens. Root rot and stalk rot often go hand-in-hand. Other causes for loss in stalk integrity can include large ears (nutrient sinks) that the plant can’t fill out, without using some of the stalk resources. In 2018 we saw many fields where the crop was moving through growth stages quickly and setting what appeared to be good yields. However, weather conditions changed midseason, with wet weather and more cloud cover, combined with nitrogen issues in some fields. This led to large ears that needed to be filled out, with again, limited photosynthetic capacity. The stalks were scavenged for carbohydrate, leaving them, again, with limited integrity. Now throw in some tar spot. Yet, another foliar disease that can limit photosynthetic capacity of the corn plant. We have observed many fields with significant stalk integrity issues. Whether just tar spot, or tar spot combined with GLS, NLCB, and/or stalk scavenging just for carbohydrates – stalks are in bad shape in many areas of Wisconsin. This is resulting in significant lodging issues in many fields, especially those hit with bad storms over the last several weeks (Fig. 2). Harvesting fields with low stalk integrity early will be key to protect yield potential. Conduct a “pinch” test or “push” test to determine which field have lower stalk integrity. Simply pinch stalks or push stalks to a 30 degree angle. Those plant that are soft and easily pinch or don’t pop back up after pushing, have stalk integrity issues. If 30-50% or more of these plants are identified with stalk integrity problems, they should be harvested first, to prevent yield losses from lodging. 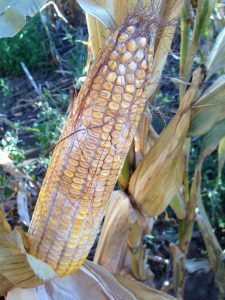 What about tar spot, lodged corn, and mycotoxins? Mycotoxins have not been implicated in the organisms reported to cause tar spot in Latin America. However, that doesn’t mean that other organisms that cause mycotoxins might not be present on harvested grain or silage. As plants dry down they can no longer actively fight fungal infection. We have looked at many brown and drying leaf samples from corn plants with tar spot. We do find many other fungal organisms, including Fusarium-organisms, which can produce mycotoxins. So while tar spot itself may not lead to mycotoxins, opportunistic fungi that colonize secondarily may result in elevated mycotoxin levels. In addition, corn that has lodged and is in contact with the wet and saturated ground is at risk of being colonized by organisms that produce mycotoxins. Many of the known mycotoxin-producing fungi are found in the soil and on residue on the surface of the soil. 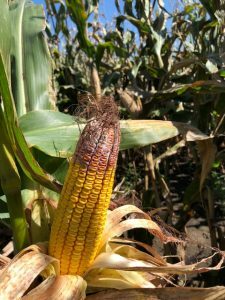 If lodged corn is in contact with the ground and there is good moisture, it is possible that the ear and plant are being colonized and mycotoxins are being produced. So while your combine might be able to pick a plant up and harvest the ear, beware that it might be heavily colonized with organisms that produce mycotoxins. If taking corn for silage, lodged plants run the risk of significant hygiene issues in the bunker, including mycotoxins issues. Where else can mycotoxins come from? Figure 3. Diplodia ear rot on an ear of corn. Corn ears don’t have to touch the ground to be infected with ear-rot fungi, they can also be colonized by ear-rot fungi through the silks. Given the kind of crazy year we have had, ear rot might be a significant concern in fields that saw erratic weather this season. Ear rots caused by fungi in the groups Diplodia (Fig. 3), Fusarium, and Gibberella will be the most likely candidates to watch for as you begin harvest. Fusarium and Giberrella are typically the most common fungi on corn ears in Wisconsin. This group of fungi not only damage kernels on ears, but can also produce mycotoxins. The toxins of main concern produced by these organisms are fumonisins and vomitoxin and can threaten livestock that are fed contaminated grain. Thus grain buyers actively test for mycotoxins in corn grain, and feed managers monitor silage for mycotoxin levels to be sure they are not above certain action levels established by the U.S. Food and Drug Administration (FDA). The FDA has established maximum allowable levels of fumonisins in corn and corn products for human consumption ranging from 2-4 parts per million (ppm). For animal feed, maximum allowable fumonisin levels range from 5 ppm for horses to 100 ppm for poultry. Vomitoxin limits are 5 ppm for cattle and chickens and 1 ppm for human consumption. For more information about ear rots and to download a helpful fact sheet produced by a consortium of U.S. corn pathologists, CLICK HERE. How do I reduce mycotoxin risks at harvest? 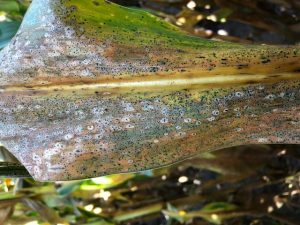 Before harvest, farmers should check their fields to see if moldy corn is present. Sample at least 10-20 ears in five locations of your field. Pull the husks back on those ears and observe how much visible mold is present. If 30% or more of the ears show signs of Gibberella or Fusarium ear rot then testing of harvested grain is definitely advised. If several ears show 50-100% coverage of mold testing should also be done. Observe grain during harvest and occasionally inspect ears as you go. This will also help you determine if mycotoxin testing is needed. If substantial portions of fields appear to be contaminated with mold, it does not mean that mycotoxins are present and vice versa. For example, Diplodia ear rot does not produce mycotoxins. However, if you are unsure, then appropriate grain samples should be collected and tested by a reputable lab. Work with your corn agronomist or local UW Extension agent to ensure proper samples are collected and to identify a reputable lab. For more information on mycotoxins and to download a fact sheet, CLICK HERE. Helpful information on grain sampling and testing for mycotoxins can be found by CLICKING HERE. For a list of laboratories that can test corn grain for mycotoxins, consult Table 2-16 in UW Extension publication A3646 – Pest Management in Wisconsin Field Crops. How should I store corn from fields with ear rots and mold? If you observe mold in certain areas of the field during harvest, consider harvesting and storing that corn separately, as it can contaminate loads; the fungi causing the moldy appearance can grow on good corn during storage. Harvest corn in a timely manner, as letting corn stand late into fall promotes Fusarium and Gibberella ear rots. Avoid kernel damage during harvest, as cracks in kernels can promote fungal growth. Also, dry corn properly as grain moisture plays a large roll in whether corn ear rot fungi continue to grow and produce mycotoxins. For short term storage over the winter, drying grain to 15% moisture and keeping grain cool (less than 55F) will slow fungal growth. For longer term storage and storage in warmer months, grain should be dried to 13% moisture or less. Fast, high-heat drying is preferred over low-heat drying. Some fungi can continue to grow during slow, low-heat drying. Also, keep storage facilities clean. Finally, mycotoxins are extremely stable compounds: freezing, drying, heating, etc. do not degrade mycotoxins that have already accumulated in grain. While drying helps to stop fungal growth, any mycotoxins that have already accumulated prior to drying will remain in that grain. The addition of acids and reducing pH can reduce fungal growth but will not affect mycotoxins that have already accumulated in harvested grain. For more information on properly storing grain and to download a fact sheet on the subject, CLICK HERE. Munkvold, G.P. and White, D.G. Compendium of Corn Diseases, 4th Edition. APS Press. Smith, D.L. 2016. Wisconsin Late-Season Corn Disease Update. /2016/09/07/wisconsin-late-season-corn-disease-update/. Smith, D.L. and Mitchell, P. D. 2016. Wet Wisconsin: Moldy Corn and Crop Insurance. 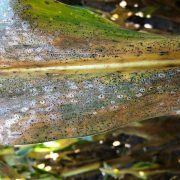 http://ipcm.wisc.edu/blog/2016/09/wet-wisconsin-moldy-corn-and-crop-insurance/. Figure 1. Tar Spot on Corn From the Arlington Agriculture Experiment station in 2018. The phone has been ringing off the hook over the past week. In fact, this morning I had to dump my voicemail as it wouldn’t take any more messages. Why is that? For those of you who have been traveling the southern Wisconsin and Northern Illinois countryside, you know why. Holy tar spot, Batman! Tar spot (Fig. 1) is no longer a cosmetic leaf disease in Wisconsin and Illinois. We have seen epic levels this season, resulting in severe damage in some fields and early dry-down of corn. Tar spot is a relatively new disease in the U.S. and Wisconsin. It is caused by a fungus called Phyllachora maydis. Tar spot causes small tar-like spots on the surface of corn leaves. For great information about tar spot and what it looks like, consult this Purdue Extension fact sheet. Tar spot was first found in the U.S. in 2015. In 2016 and 2017, tar spot was identified in Green, Iowa, Grant, and Lafayette counties in Wisconsin. In 2018 confirmations have been made in these same general areas, but also has expanded to include reports from as far north as Columbia Co. over to the eastern side of the state, including Fond Du lac and other areas of the cron belt. Severity has ranged from simple cosmetic damage to complete death of entire fields. Unfortunately, it is hard to discern why the epidemic is so significant here in the upper Midwest in 2018. Some anecdotal thoughts include hybrid susceptibility, environmental impacts, and synergistic reactions between multiple organisms. In Latin America Phyllachora maydis can be found in a complex with another fungus called Monographella maydis. In areas where the complex occurs significant yield loss has been described. However, in the U.S. Monographella maydis has not been found in complex with Phyllachora maydis. In addition, a third organism, Coniothyrium phyllachorae, has also been found to be associated with the complex. This organisms has also not been implicated in the epidemics in the Midwest. So, our epidemic of 2018 is a real head-scratcher. What is known about tar spot? Figure 2. Tar spot with “Fisheyes” on the upper surface of corn leaves. Tar spot is favored by cool conditions (60-70 F) and high relative humidity (averages above 75%). It is generally accepted that when Phyllachora maydis occurs by itself, damage is cosmetic in nature and does not result in significant yield reductions. This has been most of the case since 2016 when tar spot was first identified in Wisconsin. In Latin America where Phyllachora maydis can form complexes with Monographella maydis and/or Coniothyrium phyllachorae, “fisheye” symptoms along with severe necrosis and early dry down can be observed. In Latin America, it has been reported that when in complex, damage from tar spot can result in yield loss as much as 30%. The main method to manage tar spot in Latin America is to use resistant hybrids. Little is known about effective fungicides, especially fungicides that might be available in the U.S. So is tar spot behaving the same in the Midwest U.S. as in Latin America? The simple answer is, I don’t know. We can easily find the presence of Phyllachora maydis on affected corn in the Midwest. However, we aren’t able to easily find the other organisms that have been implicated. However, we do find “fisheyes” and significant necrosis on corn leaves (Figs. 2 and 3). It could be that Phyllachora maydis is forming a complex with other organisms in the Midwest. Things don’t have to be the same as in Latin America. One simple observation is that in areas where gray leaf spot (GLS) got an early foothold on corn, we have seen more severe epidemics of tar spot. Is that the complex in Wisconsin? Not sure, but definitely a lot of damage in some fields by both organisms. This is why we are working hard right now to identify organisms implicated in causing this damage. We need to know what the complex might be here in Wisconsin and the Midwest. What is the impact on yield and do I need to worry about mycotoxins? Figure 3. Tar spot with “Fisheyes” on the lower surface of a corn leaf. We are not sure what the impact on yield will be yet. This is a hard question to answer and will depend on when the epidemic started in a field and how severe symptoms will be. If I had to make an educated guess, on grain corn, damage will likely range from none, to low test weights on moderately affected fields, to some yield loss in fields that were hit early. On silage corn, it might be difficult to pack the bunker as dry-down is occurring rapidly and moisture might be too low to make quality silage. Mycotoxins have not been implicated in the organisms reported to cause tar spot in Latin America. However, that doesn’t mean that other organisms that cause mycotoxins might not be present on harvested grain or silage. While we don’t expect there to be an issue with mycotoxins, I would encourage you to continue to test grain and feed to be sure mycotoxins are not present. What should I do with fields affected by tar spot? Scout these fields. It will be important to make timely harvest decisions. For fields that will be taken for grain, consider harvesting these fields early. One observation we have made is that in fields affected by early epidemics and dry-down, stalks have been scavenged for nutrients to finish filling the ear. This is leaving stalk integrity in some of these fields as highly questionable, with various stalk rots moving in. Timely harvest will be key in these fields before excessive lodging occurs. For silage, other considerations, such as high-moisture corn, might be needed where corn is too dry to effectively pack the bunker. Also, be sure to continue to test for mycotoxins just to be sure there aren’t other organisms capitalizing on already stressed corn plants. DO NOT apply fungicides at this point. Fungicides will not be effective after the milk growth stage and most fungicides have a pre-harvest interval that has already passed for both silage and grain. What is the Wisconsin Field Crops Pathology program doing to understand tar spot? While frustrating for those of you who have to deal with this disease, we do need to take our time to try to figure out what the cause of the epidemic is. If we don’t know what to control, how do we develop a management plan? You wouldn’t just take antibiotics, if you didn’t know what caused your sore throat, would you? We are working with Dr. Nathan Kleczewski at the University of Illinois to improve our understanding of this pathogen in the U.S. 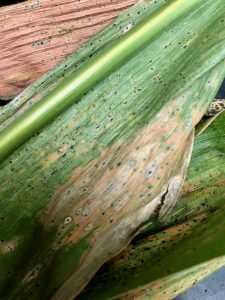 If you would like to confirm tar spot on corn, or provide samples for research purposes, you can send samples to the University of Wisconsin Plant Disease Diagnostic Clinic. If we can get a better handle on what is causing the the significant damage on corn, we can make informed decisions about how to manage it. Our program is also rating and taking notes in fungicide trials where we have tar spot. We aren’t sure we will find differences, but taking notes on timing of application and products will inform our recommendations. We also are looking for hybrid trials where we could take notes on resistant hybrids. Finally, we have initiated a late-season field trial to begin to understand the epidemiology of this disease. If we can understand when it moves in and how long it takes to see symptoms after infection, we might be able to better apply in-season management strategies. In summary, we are working on trying to find some answers, but research and acquiring relevant data will take a little time. 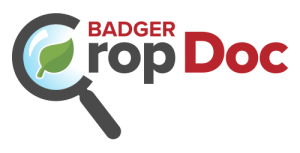 https://badgercropdoc.com/wp-content/uploads/sites/5/2018/08/IMG_3763.jpg 1280 960 damonsmith https://badgercropdoc.com/wp-content/uploads/sites/5/2018/05/bcd-color-300x153.png damonsmith2018-08-29 15:48:222018-08-29 15:49:13Holy Tar Spot, Batman! Scouting by my team and phone calls from extension personnel, consultants, and farmers have made it evident that there are several foliar diseases of corn showing up in this first part of August. Gray leaf spot (GLS), northern corn leaf blight (NCLB), and tar spot have all been found in various locations over the last week or so. It is becoming very late in the season to try to control GLS or NCLB. Current data on tar spot indicate it likely doesn’t need to be controlled. Thus, there is likely not much to do at this point, but to document which fields have which diseases. This can help in fall scouting to make harvest decisions, as fields with higher levels of leaf disease may not have experienced any yield loss, but might have stalk integrity issues, which could lead to lodging. Determining which fields might be more prone to lodging can help establish harvest order to minimize any losses due to severely lodged plants. Below is more information about each foliar disease. Gray leaf spot is cause by a fungus named Cercospora zeae-maydis. During times of very warm temperature and high humidity (greater than 90%), GLS can increase rapidly on susceptible hybrids. 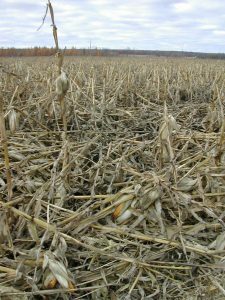 In fields with large amounts of corn residue (e.g. corn-on-corn rotation, minimal tillage, etc.) GLS may be more prominent due to higher levels of inoculum. Symptoms start as small narrow, blocky lesions that might be tan in the center and have a darker margin (Fig. 1). Lesion can increase in size and number and will typically move from lower leaves to upper leaves. Yield loss is most prominent when lesions reach the ear leaves either 2 weeks before tasseling or two weeks after tasseling. Currently, in Wisconsin, we have seen few fields where lesions have reached the ear leaves prior to brown silk. However, in a small number of fields planted to a susceptible hybrid, there has been rapid increase to the ear leaves prior to tassel. In those fields a fungicide application may result in adequate yield protection to cover the cost of fungicide application. See my previous article on how to make the decision to spray fungicide on corn. Figure 2. Northern corn leaf blight on corn. Northern corn leaf blight is caused by the fungus Setosphaeria turcica. The fungus is most active when wet weather coincides with temperatures between 65 F and 80 F. During these conditions, the fungus will readily make microscopic spores (called conidia) inside the symptomatic areas of leaves and those spores will get splashed onto more leaves. Therefore, the disease typically moves from the lower canopy, up the corn plant as the season progresses. When temperatures get above 80 F and it is dry, growth and spread of the fungus slows dramatically. This is why little NCLB was observed in July, but is showing up now. It is all about the temperature at which the fungus likes to grow. Lesions initiate as cigar-shaped lesions on lower leaves. When conditions are conducive lesions can expand and increase, moving rapidly up the plant (Fig. 2). Occasionally a gray-to-black fuzzy growth is evident in the center of lesions. This growth is sporulation of the fungus. Like GLS, yield loss is greatest when lesions reach the ear leaf either two weeks before or two weeks after tasseling. Again, consult my previous article on how to make the decision to spray fungicide on corn. Tar spot is a relatively new disease in the U.S. and Wisconsin. It is caused by a fungus called Phyllachora maydis. Tar spot causes small tar-like spots on the surface of corn leaves. For great information about tar spot and what it looks like, consult this Purdue Extension fact sheet. Tar spot was first found in the U.S. in 2015. In 2016 and 2017, tar spot was identified in Green, Iowa, Grant, and Lafayette counties in Wisconsin. In 2018 confirmations have been made in these same general areas. In Latin America Phyllachora maydis can be found in a complex with another fungus called Monographella maydis. In areas where the complex occurs significant yield loss has been described. However, in the U.S. Monographella maydis has not been found in complex with Phyllachora maydis. Furthermore, Phyllachora maydis is not known to cause yield loss on corn in the U.S. While it can be a striking disease, fungicide applications are not recommended for tar spot in the U.S. Much more work is needed to characterize this pathogen and understand the disease. We are working with Dr. Nathan Kleczewski at the University of Illinois to improve our understanding of this pathogen in the U.S. 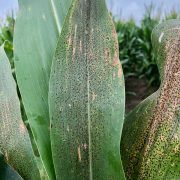 If you would like to confirm tar spot on corn, or provide samples for research purposes, you can send samples to the University of Wisconsin Plant Disease Diagnostic Clinic. What about Spraying Fungicide After Hail Damage? The best study on this subject was conducted by my colleagues at Iowa State University a couple years back. They found that for the most part application of fungicide after hail does not result in any benefits. Especially after the R2 growth stage. We also had an opportunity to look at a natural hail event in 2014 at Arlington. This happened around VT. We were also unable to find a significant difference in treating with a fungicide versus not treating after late season hail-damage. In addition, it isn’t likely that fungal infections will increase after hail. In fact in the Iowa State University study, they found a negative correlation between hail damage and fungal disease. Hail CAN increase Goss’s wilt risk. However, Goss’s wilt is caused by a bacterium. Thus, fungicide application does not work for this disease. For more information on Goss’s Wilt and how to manage it click here. In summary, given the current market prices and the fact that corn is generally through the silking period, fungicide application on hail-damaged corn is not needed.